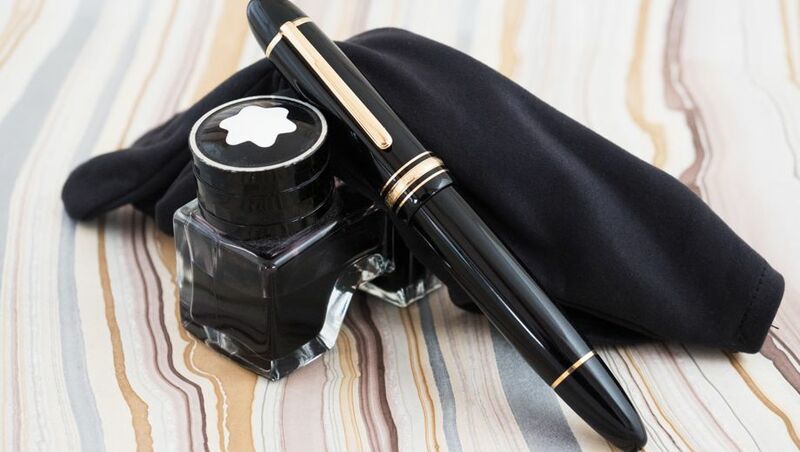 We've previously looked at how Montblanc makes its famous pens, but the German company also offers a bespoke service to create a fountain pen nib perfectly suited to your own hand and writing style. 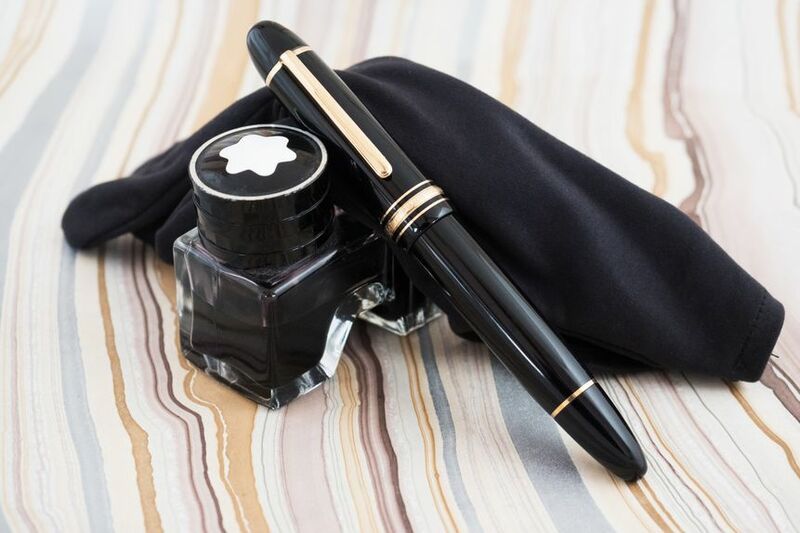 Montblanc has been offering this at its boutiques since 2012, although its Creation Privée department will make one-off custom nibs as part of its bespoke pen creations as well. The bespoke nib service is oriented around making a nib that's customized for your personal style of writing – people handle pens in ways that are extremely idiosyncratic and while the standard assortment of available styles can produce a "good enough" writing experience, the more specific the shape and other characteristics of a nib can be made to the individual, the better. The standard repertoire of nibs consists of four sizes: extra fine, fine, medium, and broad. People who write in a small, rapid hand are often happier with a finer nib; medium is, well, a happy medium; broad nibs are good for those who write in a larger hand, or will use their pen mostly for signatures. 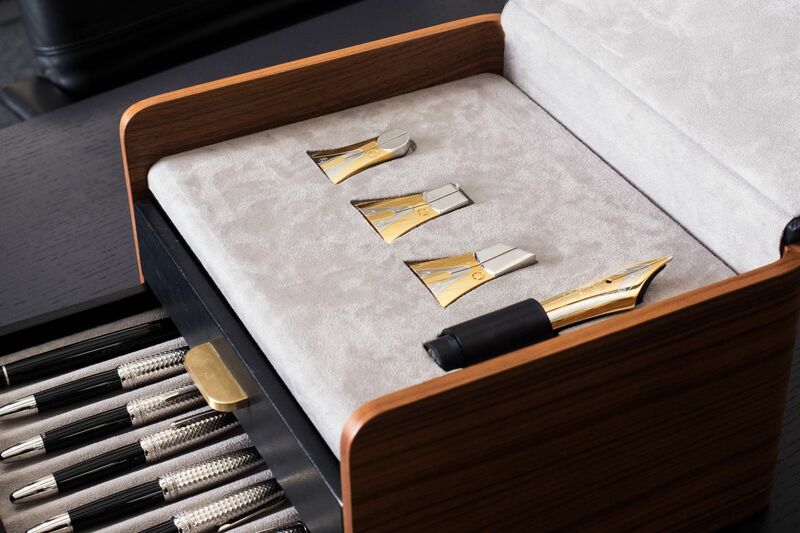 The bespoke nib service, on the other hand, begins by matching you with a much wider assortment of nibs, which including a variety of extra broad and oblique nibs. The double broad and oblique nibs offer a rather calligraphic look to one's writing, as the horizontal strokes will be much narrower than the vertical, thanks to the shape of the tipping material. The process of evaluating your handwriting is fairly straightforward. 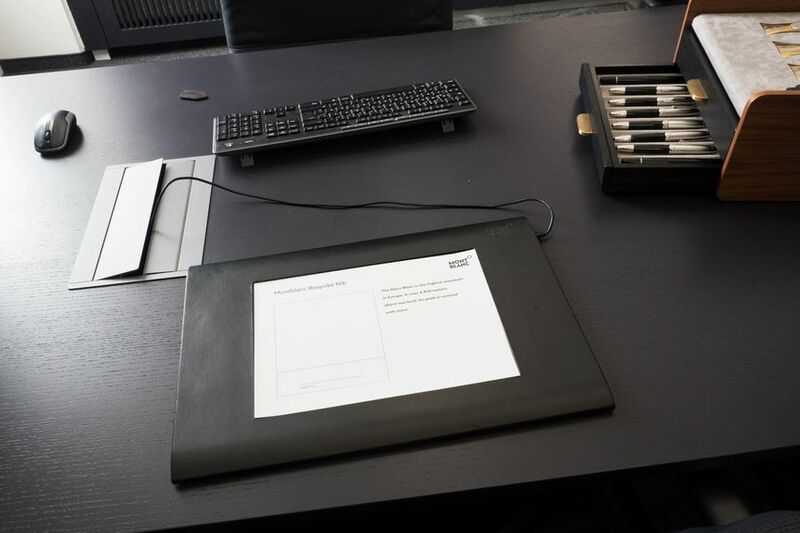 You write a test sentence, using a specially designed pen, on a pressure-sensitive pad; the pen is equipped with a wireless motion sensor that evaluates five factors. These are writing pressure, speed, angle, pen rotation, and swing. 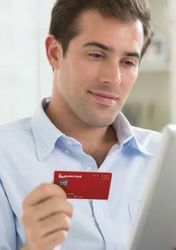 Once you're done writing your test sentence, a software package crunches the numbers and generates a data plot of how you write, and a recommendation is made for the type of nib that best suits your writing style. 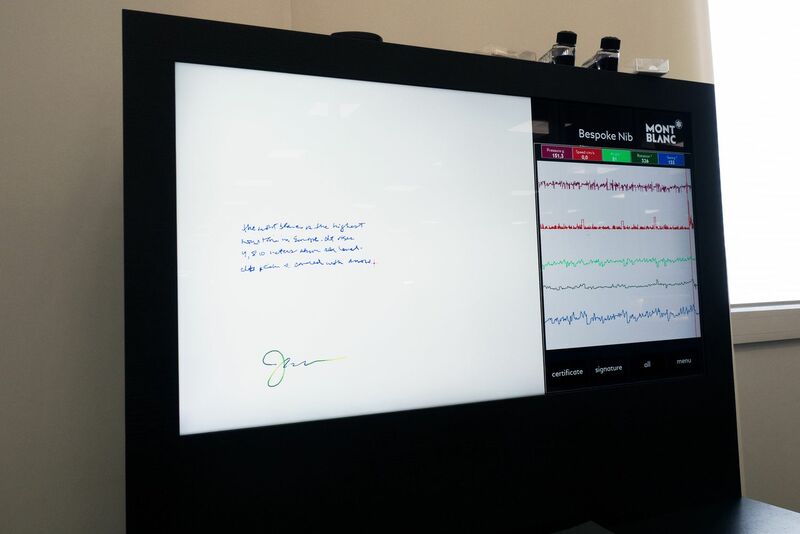 It's a distinctly strange sensation – handwriting is very personal and you feel almost as you would in a doctor's office, answering probing questions from a stranger. 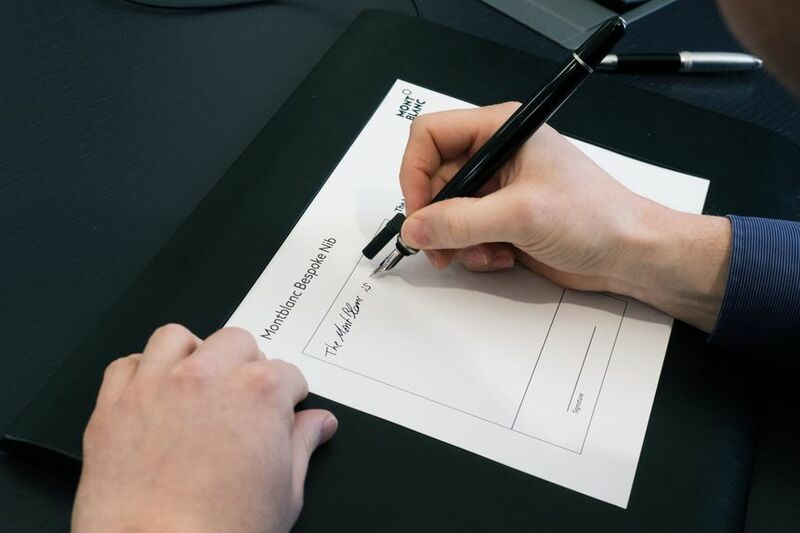 Handwriting is something about which many people are a bit self-conscious, and in an odd way, it has become something much more private than it used to be. With so much correspondence taking place digitally, and moreover filtered through the inevitable de-personalization created by social media, handwriting – that most intimate and ancient form of communication – has become something few of us ever see, and our own is seen with decreasing frequency by others. However, writing with a fountain pen offers an antidote to the leveling effect of digital communication, and even writing with a test pen better suited to my own writing habits (for the record, right oblique fine, for which I'd request a bit of flex) was a revelation. There is a joyful ease and sense of clarity in expression that the right pen can create, and though the cost of the bespoke nib service (€1,400 or A$2,200, with a wait of about six weeks to produce) may seem frivolous, it's actually one of the cheapest ways I can think of to experience a really meaningful luxury. Fabulous, I really love articles like this. 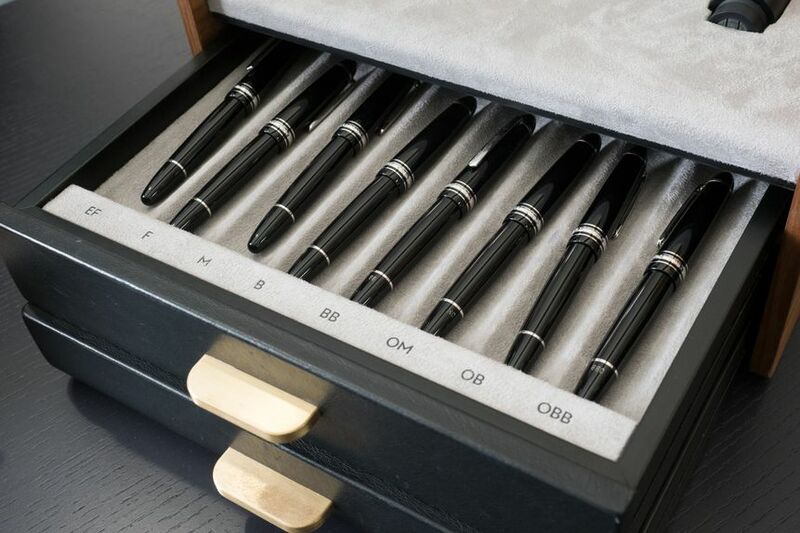 Comment on "The write stuff: Montblanc's bespoke nib service"